Visitors to the Disney Gallery at Disneyland earlier this year were treated to a colorful exhibit of the whimsical artwork of Mary Blair. On October 20 at 7:30 p.m., fans of her work will again be able to celebrate Blair's unique artistry when the Academy of Motion Picture Arts and Sciences presents "Mary Blair’s World of Color: A Centennial Tribute" at the Samuel Goldwyn Theater in Beverly Hills. Panelists for the discussion will include noted film makers and animators Pete Docter (Toy Story, Wall-E, Up), Mike Giaimo (Pocahontas, Home on the Range), Eric Goldberg (Aladdin, Fantasia 2000), Susan Goldberg (The Hunchback of Notre Dame, Hercules) and Daisuke "Dice" Tsutsumi (Toy Story 3). The panel will be moderated by animation critic and film historian Charles Solomon. Mary Blair joined the Walt Disney Studios in 1940 and soon established herself as a highly talented concept artist and color stylist. She favored bold colors and unique geometric designs in her work, which inspired the look of Disney's post-World War II animated films including Cinderella, Alice in Wonderland and Peter Pan. 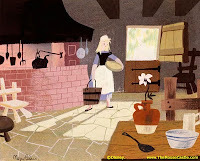 Beyond Disney animation, Blair contributed significantly to the look and design of It's a Small World at Disneyland and to the massive tile murals in the Grand Canyon Concourse of the Contemporary Resort Hotel at Walt Disney World. She was named a Disney Legend in 1991. "Mary Blair’s World of Color: A Centennial Tribute" is the latest installment of the Marc Davis Lecture on Animation series presented by the Academy. Named for the legendary Disney animator and Imagineer (who worked with Blair to design It's a Small World), the series provides "a forum for established film animators and other experts in the craft to share their experiences as well as explore with their colleagues the challenges of creating animation for the screen." Tickets go on sale Monday, October 3 and can be purchased online at http://www.oscars.org/. Prices are $5 for the general pubic and $3 for Academy members and students (this is a great deal). "Like" Our New Facebook Page, Win a Pixie Prize!